This Friday I’d like to continue though the country house featured last week into the major (double) bathroom remodel. This house has two bathrooms, a very small master bath, and a very large guest bath. Because the master gets a lot more use than the guest, we decided to borrow a little from one and add a little to the other. Doing this required some major demo and reconstruction. 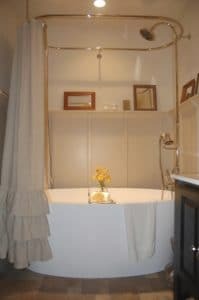 With the new space acquired in the master bath, we were able to add a tiled walk-in shower, two sinks, and a cozy bench. Warm coral and tan hues in the tile give a calm look and are offset by a rich, dark chocolate finish for the cabinetry. Creamy yellow, AS16S, completes the look with a soft glow. The guest bathroom continues with the spa theme where a gorgeous soaking tub is the star. By repurposing some of the homeowner’s rustic antiques, we were able to create a space that has personality and charm. Pairing these pieces with updated fixtures, a fresh paint job in soothing, coordinated colors, and some warm, stone-like tile is the perfect way to elevate their personal style to a refined ,eclectic look. We paired AS01S, a soft khaki tan, on the lower half of the bathroom walls, with a warm white for the upper half. Muted tones, natural stone, fresh towels and wildflowers are the perfect combination for creating a unique spa retreat in your own home. Weather it’s Decorate With What You Own, or a residential remodel, Allison Smith Design can give you the spa treatment at home.